ion8 Forfarshire CC is located at Forthill Community Sports Club in Broughty Ferry where the Mackays Forthill ground has been the club's home since it was founded in 1880. In 2018, four senior and five junior teams competed in national and local leagues and cups, along with occasional friendlies. Season 2015 was hugely successful for the club with Forfarshire winning the Murgitroyd National T20 Knockout, Forthill winning the North East Championship, Forthill 2nd XI winning the Two Counties Cup and Forfarshire under 18's winning the Scottish Cup. In 2019, ion8 Forfarshire 1st XI will play in the Cricket Scotland Eastern Premiership - having been promoted to the top level of cricket in Scotland in 2013 - while the 2nd XI play in the North East Championship, the top division of the Strathmore & Perthshire Cricket Union. ion8 Forfarshire 3rd XI compete in SPCU Division One with the club's development team, ion8 Forfarshire 4th XI, continuing their journey in SPCU Division Two to help young players make the transition from junior to senior cricket. Junior cricket is a major part of the club and the hard work of recent years has seen rich rewards with the 2015 u18 Scottish Cup win coming two years after winning the u15 Scottish Cup - the first time in nearly 30 years that this trophy rested at Forthill. Our thriving junior section provides high-quality training sessions organised by qualified coaches all year round, with participation in local leagues and national cups from the under 10 age-group upwards throughout the summer. New members for all teams and age-groups are always welcome. To request more information, use the Contact page, or just come along to one of the training sessions. 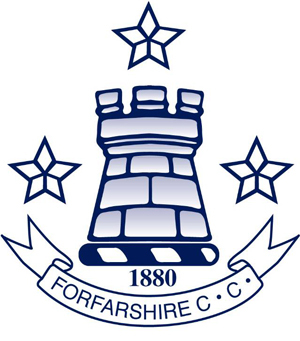 For more information about Forfarshire CC, see the New Member Information or use the Contact page to get in touch. Autoecosse Forfarshire CC is located at Forthill Sports Club in Broughty Ferry and the Forthill ground has been the clubs home since it was founded in 1880. In 2014, four senior and five junior teams will compete in national and local leagues and cups, along with occasional friendlies. In 2013, Autoecosse Forfarshire gained promotion to the Cricket Scotland Eastern Premiership to see top level cricket return to Forthill in 2014. Autoecosse Forthill finished mid-table in the Premier Division of the Strathmore & Perthshire Cricket Union whileAutoecosse Forthill 2nd XI brought more silverware to the club by winning SPCU division one and the club's development team, Autoecosse Forthill 3rd XI, finished a creditable third in SPCU Division 2 North. Junior cricket is a major part of the club and the hard work of recent years was rewarded when the under 15 team won the 2013 Scottish Cup, the first time in nearly 30 years that this trophy rests at Forthill. Our thriving junior section provides training sessions organised by qualified coaches all year round, with participation in local leagues and national cups from the under 10s age-group upwards throughout the summer. For more information about Forfarshire CC, use the contact page to get in touch.